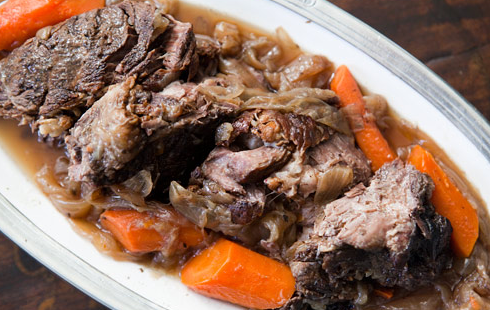 This is such a tasty, tender pot roast. It’s quick to put together and then just let it cook. You can let it cook in the crockpot for nine hours. Directions: Salt and pepper chuck roast. Brown on all sides in a large skillet over high heat for about 4 minutes per side. Place roast in the slow cooker. Sprinkle the dry soup mix over the top of the roast. Then add the liquid and onions. Cook for about 5 hours on low and then add the carrots and cook for another five hours. I put the roast in at 7 am and it was ready by 5 pm; I didn’t want the carrots to get mushy so that’s why I didn’t add them until half the cooking time was over. They were absolutely perfect.